When the Spanish colonizers arrived at the end of the 15th century, more than 90% of Cuba was covered with forest. When Fray Bartolome de las Casas visited the island, he said "La isla tiene de luengo cerca de 300 leguas y se puede andar toda por debajo de los arboles" (the island is 300 leagues long and you can walk the length of it beneath the trees). However, clearance for cattle raising and sugar cane reduced this proportion to 54% by 1890 and 14% by 1959, although reforestation since the Revolution has increased this figure to about 19%. 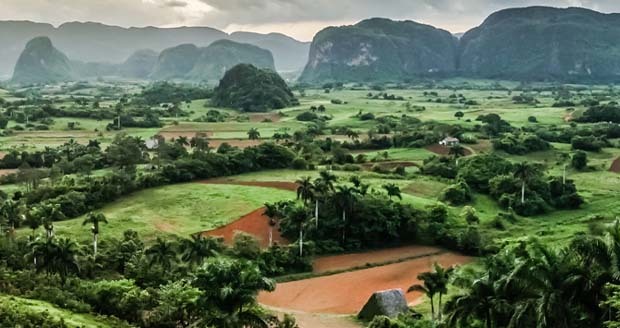 More than 6000 species of plants are present in Cuba, of which around 3000 are endemic, and 950 plant species that are endangered, rare, or have become extinct in the last 350 years. The most notable endemic species include the Pinguicola lignicola, the world's only carnivorous epiphytic plant; the cork palm (Microcycas calocoma), an endemic living fossil which is a threatened species; and the big belly palm (Colpothrnax wrightii) which is easily distinguished by its shape. Cuba's endemic plant world also includes the Cuban magnolia (Magnolia cubensis), an evergreen tree magnolia native to the forests of the Sierra Maestra Mountains. The Moa Dragon Tree (Dracaena cubensis) considered a relic and living fossil is found only on soils derived from serpentine rocks in eastern Cuba. The Cuban Pine (Pinus cubensis) is a pine endemic to the eas tern highlands of the island. And the Cuban Melon Cactus (Melocactus matanzanus) is found in coastal scrublands of the country. There are around 100 different palm trees in Cuba, of which 90 are endemic. The palma real or royal palm (Reistonea regia) reaching up to 50 meters tall, is Cuba's national tree. Other trees found in the island include oaks, cedars, flamboyant trees, and the jaguey- a huge fig tree with aerial roots. The orchid family includes some 300 endemic species. There is one tiny orchid )Pleurothallis shaferi) which is only 1 cm, with leaves measuring 5 mm and flowers of only 2 mm. The mariposa or butterfly flower (Hedychium coronarium), a type of jasmine, is considered the national flower. Animal life is also varied in Cuba, with over 15,000 species of fauna, of which 10% could be on the verge of extinction: 250 vertebrate species are endangered, rare or have become extinct in the last 350 years. The total number includes 42 mammals, 350 species of birds, 121 reptiles, 46 amphibians, 2947 mollusks, 7493 insects and 1300 arachnids. Cuban reptiles include crocodiles, iguanas, lizards, salamanders, sea turtles, and 15 species of nonpoisonous snakes. Endangered species include t he manjuari or alligator gar (Atractosteus tristoechus), a combination of fish and reptile considered a living fossil; the Cuban crocodile (Crocodylus rhombifer) found only in Cuba's Zapata Swamp and the Isle of Youth; the Cuban rock iguana (Cyclura nubile) found only in Cuba and the Cayman Islands; and the Cuban boa (Epicrates angulifer) that can grow up to 4 meters long and may live up to 20 to 30 years. There are no native large mammals but some genera and families have diversified into a large number of distinct island species. These include mammals such as the Cuban hutia (Capromys pilorides), an inoffensive rodent about 60 cm long that lives on tree leaves; and the almiqui or Cuban Solenodon (Solenodon cubanus), declared officially extinct in 1970 and rediscovered in 2003. The protected Antillean manatee (Trichechus manatus manatus) is reproduced in more than 20 breeding groups, mostly in the Cienaga de Zapata and north of Villa Clara. Cuba claims the smallest of a number of animals, such as the tiny frog Monte Iberia Dwarf Eleuth (Eleutherodactylus iberia) only 0.3 inches long and exclusively found in some mountainous regions of eastern Cuba; the butterfly bat (Natalus lepidus), which is only 7 inches from wingtips and weighs just a couple of grams; and the endangered zunzuncito or bee hummingbird (Mellisuga helenae) roughly 3 inches long. There is also a dwarf scorpion (Microtityus fundorai) between 0.3 and 0.7 inches long among males. Among the 350 species of birds found in Cuba are the flycatcher, crane, flamingo, hawk, kingbird, owl, parrot, parakeet, warbler and woodpecker. Endemic species include the Cuban Tody (Todus multicolor), the Cuban Green Woodpecker (Xiphidiopicus percussus), the Cuban Parakeet (Aratinga euops), the Blue-headed Quail-dove (Starnoenas cyanocephala), the Cuban Gnatcatcher (Polioptila lembeyei), the Zapata Wren (Ferminia cerverai), the Cuban Sparrow or Zapata Sparrow (Torreornis inexpectata), the Cuban Crab Hawk (Buteogallus gundlachii), the Bare-legged Owl or Cuban Screech-owl (Gymnoglaux lawrencii) and the Zapata Rail (Cyanolimnas cerverai). Another endemic, the Cuban Trogon (Priotelus temnurus), is considered Cuba's national bird.